Just 19 seconds into the game Southwood’s Carson Blair raced 65 yards for a touchdown and the Knights never looked back, defeating North Miami 34-0 on Friday. The Knights took the opening kick off and on the first snap Blair put the Knights up 6-0. Ever heard the old saying ”what goes around comes around”. For years the Tippecanoe Valley football team issued some beat downs on their home field against Wabash County teams. Last Friday night the Northfield Norseman repaid the debt. Northfield score first and often Friday as they built their lead to 52-0 in a 59-7 old fashion romp over the Vikings. The Southwood Lady Knight golf team put three players in the top five to secure winning the TRC tournament at Norwood Golf Course Saturday. Dayna Dale finished runner up behind Rochester’s Kinley Lingenfelter. Danielle Pegg finished fourth with Danielle Sparling fifth. The top ten finishers were named all conference. Also from the county making all conference were Kelsey Eichenauer of Manchester (sixth), Chelsea George of Northfield (ninth) and Lydia Little of Manchester (10th). The Northfield and Wabash volleyball teams went the distance Thursday with the Norse defending home turf 14-25, 25-21, 8-25, 25-21, 15-13. Wabash would dominate game one after trailing early. Down 7-6 the Apaches would get a tip from Jaycee Parrett during a 5-0 run to grab a 12-6 lead, then got kills from Kristin Cromer and Sam Irgang to increase the lead to 16-8. The Norse would take advantage of a few Wabash mishaps to close the gap to 20-14 when the Apaches scored 5 straight to end the game. During the last run Brooke Irgang had a kill and Cromer an ace, 25-14. The Rochester volleyball team defeated Southwood, 3-2, on Thursday night in a Three Rivers Conference matchup. Rochester won the first two sets before the Lady Knights battled back for 29-27 and 25-18 in the third and fourth sets, respectively, to set up the fifth and deciding set. BUNKER HILL -- The Wabash football team had a big date at Maconaquah on Friday as the Apaches took a perfect 3-0 record into the game. 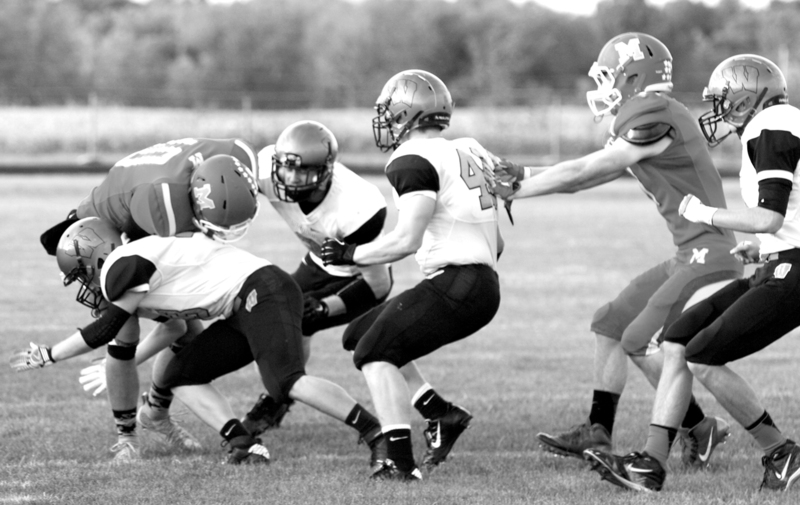 The Braves also boasted a 3-0 record with both teams being in the south division of the TRC. It would be a match up of the Braves offensive line size against the Apache defensive speed, with speed overcoming size as Wabash moved to 4-0 for the first time since 1966 in a 24-7 and take sole possession of the south division. 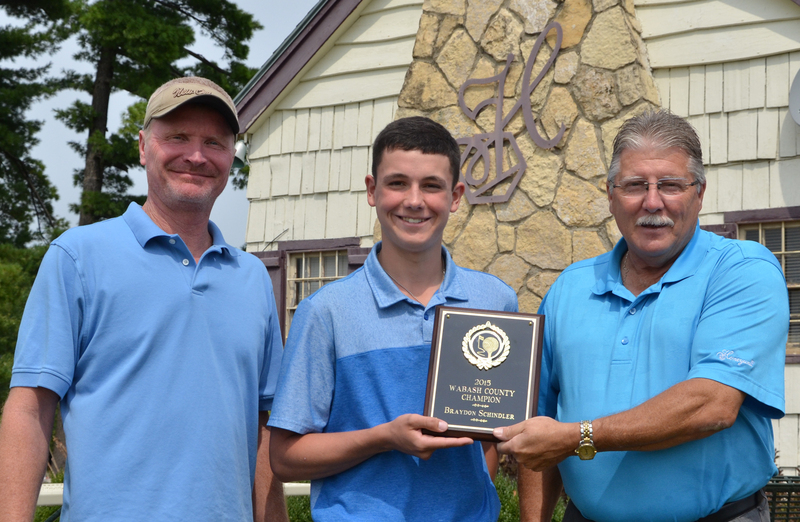 After two golf courses and 36 holes, Braydon Schindler, a Northfield High School senior, took home the Wabash County Amateur Golf Tournament champion title the weekend of July 25-26. Approximately 39 golfers of all ages participated in the two-day tournament began which began on Saturday July 25 at the Honeywell Golf Course. It concluded the following day at Etna Acres Golf Course. Schindler, 17, shot 71 on first day and 77 on the second, with an overall 148 total for the competition. It just felt good to win champion, Schindler said. Week number four of high school football is upon us already. This week’s games include Northfield (3-0) travelling to Tipp Valley (1-2), North Miami (0-3) at Southwood (0-3) and Wabash (3-0) at Maconaquah (3-0). Wabash WebTV will be at Peru High School as Manchester (0-3) take on the Peru Tigers (2-1). Broadcast time will be 6:45 and kickoff at 7pm.